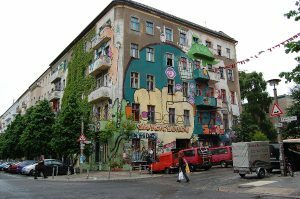 Our house, like over 200 others around Friedrichshain, is owned by Gijora Padovicz and his company Siganadia Grundbesitz GmbH, famous for the systematic buying, eviction and destruction of houses and houseprojects for commercial profit in detriment of affordable housing spaces for all. L34 is one of the few political anarcha queer feminist house projects in the world without cis men, working actively against sexism, discrimination and systematic oppressions. Spaces like this are needed. The Dorfplatz, Infoladen and Bar are important meeting points for the coming together of different political fights against the repressive system. Particularly in the current political context where the right wing is moving forward towards a historically strong reactionary position against feminism, non traditional binary roles, abortion and immigration. Many projects have already been evicted. Many others are in the process of being so. Don t let them take another house. It is not only houses that disappear with evictions but forms of self organization, diversity and political resistance which also disappear with the houses. We are all affected by gentrification. We will fight to keep our house and we need your support to do it. Make a banner, write a support text, spread the information.Make a soli event, donate some money for lawyers and anti-repression expenses, make a massive action of sending letters to Padovicz offices. Get organized against capitalism and patriarchy! WE WILL FIGHT! L34 RESISTS!